This is the next in the Xeelee Sequence, a sprawling series of hard science fiction space opera novels, novellas, and short stories which spans billions of years of fictional history, centering on humanity’s future expansion into the universe, its cosmos-spanning war with an enigmatic and supremely powerful Type IV alien civilization called the Xeelee, and the Xeelee’s own war with dark matter entities called Photino Birds. The series features many other species and civilizations that play a prominent role, including the Squeem (a species of group mind aquatics), the Qax (beings whose biology is based on the complex interactions of convection cells), and the Silver Ghosts (symbiotic organisms encased in reflective shells). Several stories in the Sequence also deal with humans and posthumans living in extreme conditions, such as at the heart of a neutron star (Flux), in a separate universe with considerably stronger gravity (Raft), and within eusocial hive societies(Coalescent) . The Xeelee Sequence is notable for its treatment of ideas stemming from the fringe of theoretical physics and futurology, such as exotic-matter physics, naked singularities, closed timelike curves, multiple universes, hyperadvanced computing and artificial intelligence, faster-than-light travel, and the upper echelons of the Kardashev scale. Whew. This is a series with a lot of hard science matters, terms and ideas involved and tossed around like confetti. The first is Raft, which you can read about here. Raft is not so riddled with quantum physics stuff, so is not too hard to understand. But Timelike Infinity really tests your knowledge base of (and possibly even your tolerance for) all those quantum science ideas and terminology. 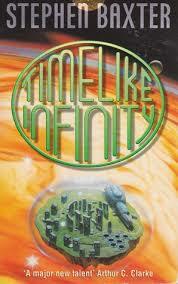 Although Raft was the first written and published,(1992) and Timelike Infinity the second (1992), Baxter recommends if you are now just starting the journey, that you read Timelike Infinity third, and Raft sixth in the series as it finally was constructed. But he also says that he feels each book or story or novella should be a stand alone, and able to be read in any order, just as time is not linear. Neat idea. OK, to the story line. This is not a sequence to Raft. Raft is set in AD 104,858. Timelike Infinity is set in 5407 AD, so it actually predates the events in Raft. The human race has been conquered by the Qax, a truly alien turbulent-liquid form of life. OK; what does that mean? It means that the turbulence of a liquid IS the lifeform. They travel in what is essentially a giant aquarium in which the liquid is constantly in motion, and communicate through some kind of voice simulator. They now rule over the few star systems of human space – adopting processes from human history to effectively oppress the resentful race. Humans have encountered a few other races, including the astoundingly advanced Xeelee, and been conquered once before – by the Squeem – but successfully recovered. In this book, we are introduced to the ambassador for the humans to the Qax, and they watch as a wormhole begins to form, and then they see the firing of particles which preceeds a ship from …. the past? The future? Meanwhile, a group of young people have built a ship with a hyperspace drive secretly under the earth in what we today would call England. Right under Stonehenge, as a matter of fact. They manage to take off right under the nose of the Qax, assuming the Qax have a nose, into the wormhole and travel back 1,500 years in time. They call themselves the Friends. The Friends believe that quantum wave-functions do not collapse like the Copenhagen interpretation holds, nor that each collapse actually buds off separate universes (like the quantum multiverse hypothesis holds) but rather that the universe is a participatory universe: the entire universe exists as a single massive quantum superposition, and that at the end of time (in the open universe of the Xeelee Sequence, time and space are unbounded, or more precisely, bounded only at the Cauchy boundaries of “Time-like infinity” and “Space-like infinity”), when intelligent life has collected all information (compare the Final anthropic principle and the Omega Point), and transformed into an “Ultimate Observer”, who will make the “Final observation”, the observation which collapses all the possible entangled wave-functions generated since the beginning of the universe. If you had a black hole in your kitchen you could just throw in the waste and see it compressed to invisibility in a fraction of a second, releasing floods of usable short-wavelength radiation. Of course you’d have to find some way of keeping the singularity from eating the Moon. Exotic matter is mass/energy that is compressed to singularity densities, almost, so that the superforce emerges to bind it together — and then allowed to cool and expand so that the superforced breaks open in a controllable manner, to give us the negative-energy characteristics we want. How far could we take this? I’d anticipate the manufacture of singularities themselves, on the scale of a few tons up to maybe, asteroid masses. See what I mean? It has a number of plot threads for different people/groups of people and different time periods. It is a lot of fun to read, and it really exercises your brain trying to keep it all organized in your head. I looked up timelike infinity, and it basically is a kind of measurement for singularities, because you know, your tapemeasure is just not going to cut it. I have been on a sci fi binge, lately. Just finished the Spin Trilogy, and now have embarked on what looks to be another fine series of hard science sci fi books called the Xeelee Sequence. 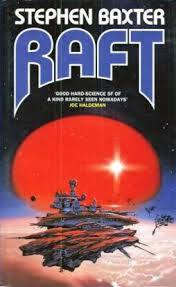 Raft is book #1 of this series. A spaceship from Earth accidentally crossed through a hole in space-time to a universe where the force of gravity is one billion times as strong as the gravity we know. Somehow the crew survived, aided by the fact that they emerged into a cloud of gas surrounding a black hole, which provided a breathable atmosphere. Five hundred years later, their descendants still struggle for existence in the Nebula. In the Nebula, are three human species locations. One is the raft, a motley collection of edifices, topped by a control room, all built on the remains of the original space ship. The folks there have some kind of machine that makes food, and there is a scientist class of people devoted to trying to understand the universe through physics and retro engineering stuff. The second is the Belt. This is a small collection of shacks in orbit around a dead sun, which they mine for iron and other materials. The gravity within the core of this sun is so great that the miners sit in special chairs because they cannot stand in the gravity, and operate robot mining machines. They trade their mined stuff for food and goods from the Raft. The third location is a hoot, but almost the most interesting of them all. It is a tiny planetoid, with a strange surface of what looks like leather. They are cannibals, who occasionally improve their diet by luring in a passing ‘whale’, a giant creature that floats around in the sky. It turns out that the core of the planetoid is a space ship control center, upon which years, generations, of bones have been piled, actually creating the planetoid. In the ultra high gravity there, it was not actually possible to throw anything away into space, so the original stranded crew on or in their brokendown ship left the bodies to rot and the bones to pile up. After they ran out of food, they found a way to process the meat from the dead bodies so the toxins, etc were destroyed and what was left was edible and drinkable. They used the skin to cover the surface. After a while, as the bones added up, they had to live on top of them, and when our protagonist first met them , the Bonies, the pile was about 15 meters deep. The small bonies population were all the descendants of that original crew. Fascinating concept, the most original I have come across in my sci fi readings. A spaceship from Earth accidentally crossed through a hole in space-time to a universe where the force of gravity is one billion times as strong as the gravity we know. Somehow the crew survived, aided by the fact that they emerged into a cloud of gas surrounding a black hole, which provided a breathable atmosphere. Five hundred years later, their descendants still struggle for existence. Our protagonist, Rees, is a young man, tired of the unending brutal work in the mines, never enough food, and terrible living conditions. His parents have died, and he is alone. He sees the people who operate the delivery vehicles are healthy and hearty, and figures there has to be something better. He stows away in one of these vessels, which are actually living trees on some kind of wheels, is found and taken to the Raft, where he shows a better than average grasp of physics, and is allowed to remain and start classes to become one of the scientists. He sees, along with a couple of the old scientists, that their bubble inside the Nebula, and the Nebula itself, are dying, and they must try to get into a new Nebula, so they build a ship out of the control room on the Raft and take off with only about 40 people in it, instead of the planned 500 because those who were not on the list for escape were trying to destroy it altogether. Can’t blame them, really. It is a great concept, and it is not until you finish the book and think about it a bit do you come to the conclusion that even though we have to suspend disbelief in all sci fi, the implausibility factor of people surviving for 500 years on scraps and dabs in an also implausible bubble of breathable air (how convenient!) might be a little higher than is comfortable. So what. I really liked it anyway, and am now reading the next in the series, Timelike Infinity, which one third into it, seems so far to have nothing to do with the events or characters from the Raft book. But is pretty nifty in its own right. Tried to find a picture of the flying tree vessels, but apparently nobody has a clue so no fan pics. Sorry, guys. This is the third book of the Spin trilogy. 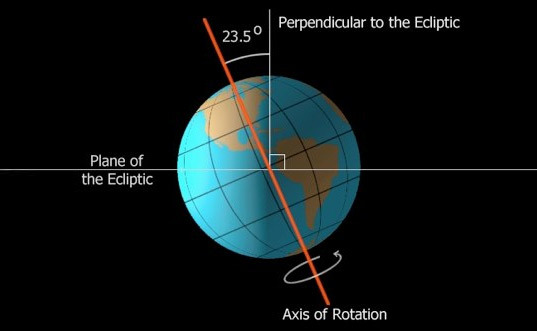 The first two are Spin, which you can read about here, and Axis, which is here. The third volume gives us a closer look at Turk Findley, whom we met back in Axis, and we meet again the half Hypothetical/half human boy Isaac. The chapters of the book alternate between two timelines: one approximately 40 years following the events of Spin and the other approximately 10,000 years following the events of Axis. Turk Findley awakens ten thousand years after he and the gene-modified boy Isaac were drawn into the Hypotheticals’ temporal Arch on the planet Equatoria, at the climax of Axis. He finds himself on an artificial floating archipelago called Vox, populated by a fanatical collective who, just like Axis’s rogue scientist Avram Dvali, (from Axis) are obsessed with making direct contact with the Hypotheticals, whom they view as no less than gods. Like all fanatics, they simply take for granted that their gods want to meet them, too, and will eagerly deliver them the spiritual ascendance they crave. Ideological conformity is monitored by an implanted node in each Vox citizen linking their minds to the Coryphaeus, Vox’s governing Network. Other human societies in the Ring of Worlds connected by the Arches oppose Vox, and Turk’s arrival coincides with one of them dropping a small nuke on Vox Core, an event that proves only a brief if significant interruption. The counter plotline has Turk’s story of his adventures on Vox somehow being channeled into the mind and the diaries of young drifter Orrin Mather. Orrin is brought into a psychiatric clinic in Houston by a cop named Bose, who, in the opinion of Dr. Sandra Cole, is taking a level of personal interest in the case unusual for an officer. Bose’s reasons become apparent as the two of them seek to unravel Orrin’s mystery. Has the boy, who’s barely literate and never demonstrated any particular creativity in his life, simply made up this far future saga? Well, I thought it was an odd way to continue the story of Turk 10,000 years in the future. Seemed like a contrived vehicle and for me, did nothing to enhance the basic premise of the fanatical group seeking their god. The Vox archipelago sails under the arch to the environs of the earth, to find the planet ravaged, ruined, and desolate. I am not sure if we are meant to assume that the human species did itself in by using all it’s resources, or we are meant to simply contemplate the passage of time and understand that nothing is forever, except possibly the Hypotheticals. Did the Vox population get to meet the Hypotheticals? Well, yes, but not in the way they had expected. Warnng…. Spoiler alert. If you plan to read this trilogy, stop reading here. The Hypotheticals, who encased the earth in a bubble that slowed down time, encased Mars in a bubble, set up arches from world to world, are ……. a process, not a thing. Not a being. They … it … evolved from a research probe sent into space who knows how long ago, which was equipped with a program for self replicating, and grew from that. Its goal is information gathering … that was the probe’s original mission, and the whole thing got out of hand and grew into this monster process whose goal was to gather all the info it could, and in fact created worlds etc. in order to find more information. So the trilogy is ultimately about our search for god, or a deity, or a something greater than ourselves to believe in, and our vulnerability and capacity for self-deception. There was generally a lot of disappointment in the book reading world with the second and third books of the trilogy, but for me, a person with perhaps lower standards than many, I enjoyed it immensely. A sweet, gentle chick lit homage to all those lovely books about books, about libraries, about book stores, about love, and about small towns. 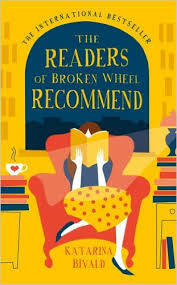 Broken Wheel is a little, decaying shard of a town in the middle of Iowa, where an older woman, a lover of books, widowed, no family, starts up a pen pal correspondence with a young woman in Sweden. The young woman is shy, and prefers to read than to socialize, works a dream job in a book store, and the two form a solid friendship, sending each other books. I so loved that, except all my jaded mind could think of was the cost of the postage to do that! When you order a book from Amazon sent to Mexico, the duty and the shipping cost more than the book itself! Hence my love for my Kindle. And ebooks. Between them, there is talk of the young woman visiting the gal in Iowa, and when her bookstore goes out of business, what has she got to lose? So off she goes to visit her American friend. Except that when she gets there, the friend has died, the funeral is just over, and the townspeople, calling her the tourist, install her in her dead friend’s house for the duration until her return flight, three months away. Everyone is kind to her, cannot understand her love of reading, and will not let her pay for anything, not the restaurant, (OK, hamburger joint), the bar, the hardware/grocery store, nothing. So she figures that she will try to do something to pay her way, by offering to help out the establishments, but that only makes the folks think she has run out of money. Once she has straightened out that misunderstanding, she decides to open a book shop in her friend’s empty storefront, using her friend’s extensive book collection. The opening of the bookstore generates a new feeling in town, where, as in all fictional small American towns, everyone is lovely and helpful and tries to get the young people together. The book touches on LBGT issues, race issues, immigration, and even has a reluctant cougar. All fairly implausible, given what I know about folks, but hey, it’s fiction, and what good is fiction if it doesn’t give us an improved world? I think this is my big beef with dystopian and apocalyptic fiction. I don’t want to see this world at its worst. I want it see it as it could be at its best. The book is by a Swedish author, written in Swedish and translated by Alice Menzies, and contains some puzzling assumptions but is no less likable for them. If you liked 84 Charing Cross Road, The Guernsey Literary and Potato Peel Pie Society, and Chocolat, you will like this one. 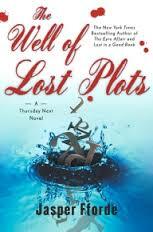 Not as deep, no real realism undercurrents as in those books, but charming in its own way. I’ve been feeling in the mood lately for some good hard science sci fi, so thought I would get back to the Spin series. I strongly recommend that you go to my review of the first book, Spin, which you will find here, because you will need it to understand Axis. 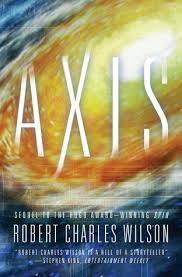 Axis takes place on the new planet introduced at the end of Spin, a world the Hypotheticals engineered to support human life and connected to Earth by way of the Arch that towers hundreds of miles over the Indian Ocean. Humans are colonizing this new world — and, predictably, fiercely exploiting its resources, chiefly large deposits of oil in the western deserts of the continent of Equatoria. Remember those folks who colonized Mars back in Spin? The reversed engineered some Hypothetical pharmaceuticals and created a drug that would add 20 or 30 more years to one’s lifespan, while at the same time making the individual more compassionate and caring. Bring it on, we could use some of that ourselves. It was all done around a kind of quasi-religious structure in order to control it. The head guy brought it to Earth on his only visit between the planets, and the Earth government was quick to outlaw it, seeing how it would surely instantly be explointed. People who took the drug were call Fourths, for what was thought of as the fourth stage of life, and it was illegal and the Fourths kept their existence very secret and hidden. Lise Adams is a young woman attempting to uncover the mystery of her father’s disappearance ten years earlier. Turk Findley is an ex-sailor and sometimes-drifter. They come together when showers of comet dust seed the planet with tiny remnant Hypothetical machines. Soon, this seemingly hospitable world becomes very alien, as the nature of time is once again twisted by entities unknown. A quasi-religious group of “Fourths” from Earth, led by Dr. Avram Dvali, lives in the desert seeded by falling dust. They’ve created a child they call Isaac with a Martian upgrade (fatal to adults) that connects him with the Hypotheticals. They are hoping he will be able to communicate with the Hypotheticals and gather some answers for them. The Fourth-hunting “Department of Genomic Security” is searching for this group or for a visiting Martian Fourth who disapproves of Isaac’s creation. 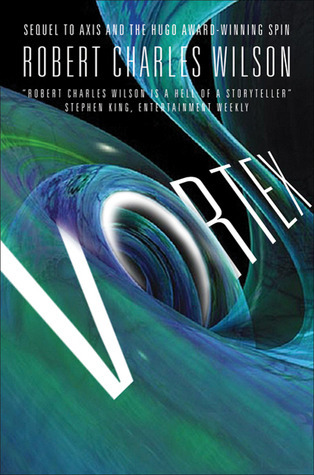 I don’t know that this a good stand-alone or merely a bridge between Spin and the third of the trilogy, Vortex, but you can read it and enjoy it without having first read Spin, but why would you? The trilogy is an examination of our notions of religion, identity, our place in the universe, and what would appear to be our need for a deity. If you prefer your sci fi to be space opera-y, and less intellectual, maybe this is not for you, although the storyline is compelling on its own without having to think too much. But if you prefer, as I do, the kind of sci fi that does what sci fi does best — that is, look at the bigger picture, ask the big questions that probably have no answers, make you realize that we really ARE just a microscopic dot in this ever-expanding cosmos, then you will truly enjoy this trilogy. This is the third in the Thursday Next series. I read the first two before I started the blog, and although I had high hopes of writing up my thoughts on those books, I think we can safely say that it is probably never going to happen. I am having trouble keeping up the blog with what I am currently reading. I do have some excuses, but they are not very good ones, so I am just going to get on with the writing. I have four more to get down on pixels, and I have an I Want to Read This One Absolutely NEXT list that is growing alarmingly fast. I used to worry about living long enough to read everything on my To Read List. Now I worry about living long enough to read everything on my I Want to Read This One Absolutely NEXT list. Jasper Fforde is a truly gifted writer. He is clever, funny, and has an imagination that stretches into the infinite mists. His style is somewhat like that of Terry Pratchett, the writing is serious, but the word play and the situations are really funny. The Thursday Next series is a series of comic fantasy, alternate history mystery novels about a young woman named, what else, Thursday Next. For Americans, we would say, about a day in the following week, next Thursday, but of course, the British use the expression, Thursday next for that, so her name has more ummmm cachet for the folks across the pond. The first series is made up of the novels The Eyre Affair, Lost in a Good Book, The Well of Lost Plots, and Something Rotten. There is a second collection, consisting of First Among Sequels, One of Our Thursdays Is Missing, and The Woman Who Died a Lot. In this parallel universe, England is a republic, with George Formby as its first president, elected following the success of Operation Sea Lion (the mooted Nazi invasion of Great Britain), occupation, and liberation. There is no United Kingdom, and Wales is the independent “Socialist Republic of Wales”. The Crimean War is still being waged in 1985, Russia still has a Czar, and the Whig Party still exists in the House of Commons. Genetic engineering is far more advanced than in our own timeline, and so Thursday has a pet dodo, Pickwick. Re-engineered mammoths can cause damage to local gardens if in their path, and there is a Neanderthal rights movement, given the resurrection of this kindred branch of human evolution. Interestingly, the duck is extinct in this universe. Computer and aviation technology are far behind our own timeline, with the transistor having never been invented (computers are still massive and run on vacuum tubes) and research into the jet engine unfunded as propeller and dirigible technology are viewed as ‘good enough’. The line between literature and reality is quite thin, allowing characters in the books and those in ‘real life’ to jump in and out of novels. This leads Thursday to change the ending of Jane Eyre, the joke being that the plot we know in our reality is the far superior change caused by Thursday. This also happens to other classic novels: Uriah Heep becomes the obsequious, and generally insincere character we know, due to an accident inside the book world, and Thursday’s uncle Mycroft becomes Sherlock Holmes’s brother. In this world, the characters in novels are self-aware, knowing they are in a book. They make comments stating they are not needed until page ‘such and such,’ rather like actors in a play, and thus have time to help Thursday. The world of fiction has its own police force – Jurisfiction – to ensure that plots in books continue to run smoothly with each reading. Thursday ends up hiding in a book, and working for Jurisfiction. The book Caversham Heights that features in The Well of Lost Plots is a detective novel featuring Detective Inspector Jack Spratt and his sergeant, Mary Mary, (listed as Mary Jones in WOLP) who swaps with Thursday. Spratt and Mary get their own Fforde series, The Nursery Crime Division books, and appear in The Big Over Easy and The Fourth Bear featuring crimes against characters in classic children’s literature. Ok, so that is a brief description of the series, lifted with no shame whatsoever on my part directly from Wikipedia. Generic term for a parasitic life-form that lives inside books and feeds on grammar. Technically known as Gerunds or Ingers, they were an early attempt to transform nouns (which were plentiful) into verbs (which at the time were not) by simply attaching an ing. A dismal failure at verb resource management, they escaped from captivity and now roam freely in the subbasements. The twentieth century has seen books being written and published at an unprecedented rate — even the introduction of the Procrastination 1.3 and Writer’s-Block 2.4 Outland viruses couldn’t slow the authors down. Authors are beginning to write the same books. There is maybe a year, possibly eighteen months, before the well of fiction runs dry. We learn of UltraWord™, which Text Grand Central, the final arbitrators of plot, setting, and other story elements,will release BOOK version 9, code-named UltraWord. UltraWord is touted at a JurisFiction meeting as the greatest advance “since the invention of movable type” because it creates a thirty-two plot story system and allows the reader to control the story. However, it has its drawbacks — it makes books impossible to read more than three times, thus rendering libraries and second-hand bookstores useless, and the quality of the writing is also substantively poorer. There are all kinds of threads and twists, and it is all too complicated to tell you all of it, but if you are a Terry Pratchett fan, and a book fan, it is a good bet you will enjoy Fforde and his cast of lovely characters. 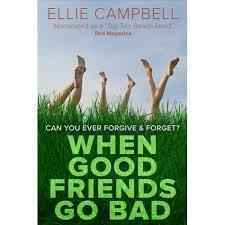 A nice, pleasant chick lit (oh, pardon me, women’s fiction) about four friends who met in grade school in England, and after an incident where they burned down a barn because they were smoking in it, were hauled off by their folks to go their separate ways. There was American Meg, fat Georgina, Jen who married a guy 8 years younger, and Rowan, terribly naive and very beautiful. It has the usual elements — boyfriends, betrayal, being dumped, etc. When they meet in their late thirties,having been out of touch for a couple of decades turns out fat Georgina had become svelte and successful with a design business in textiles and clothing, and had married Jen’s old boyfriend, who was the one who dumped her without a word. Meg, daughter of hippies show business people, was herself still a hippie, if a bit faded, and Rowen, who called the get together, was a no show. Ten years later, it is Meg who calls them together, hinting at a life or death situation, and the rest of the book is trying to find Rowen who seems to have completely disappeared. The plot, engaging as it was, is not worth recapping. It is about friendships. Not many people have friends going back to their grammar school days. It’s chick lit — that means there are relationships, emotions, ups, downs, and a happy ending. I like happy endings. I needed a palate cleanser after that post apocalypse book. Right?